The DL3, commonly referred to as the Trilogy™, is an all steel design offering the maximum carrying capacity. Considered the workhorse of the group, the Trilogy™ is the largest and heaviest model designed for full sized 102" wide transit vehicles. 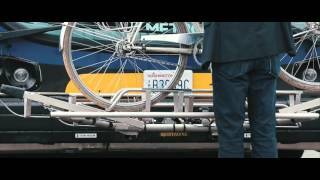 This rack carries up to three bikes, which can be loaded and unloaded independently. The Trilogy™ is available in stainless or mild steel, and comes in a variety of colors and finishes. The Trilogy's support arm accommodates bicycle with wheel sizes from 20" to 29". The wheel trays can secure bicycles with up to a 44" wheel base, and tires up to 3" wide. The racks unique No Scratch™ support arm secures the front tire without straps or cords and prevents damage to bicycles. This translates into simple and intuitive passenger use, and quick loading and unloading times to keep buses on schedule. The standard pivot plate measures 26” wide, and provides the mounting and pivot point for the bike rack. The pivot plate is connected to bumper brackets, and enables the bike rack to move between the stowed and deployed positions. The standard pivot plate is compatible with Sportworks DL2, DL3 (Trilogy) and VeloPorter series racks.